Well hello, everybody! The middle and end of 2018 got a little cruddy for me, so I fell off of the online map a bit and neglected my author presence, but never fear for I am still here! First of all, let’s talk about some recent releases (recent can be as far back as July 2018 so hang on). 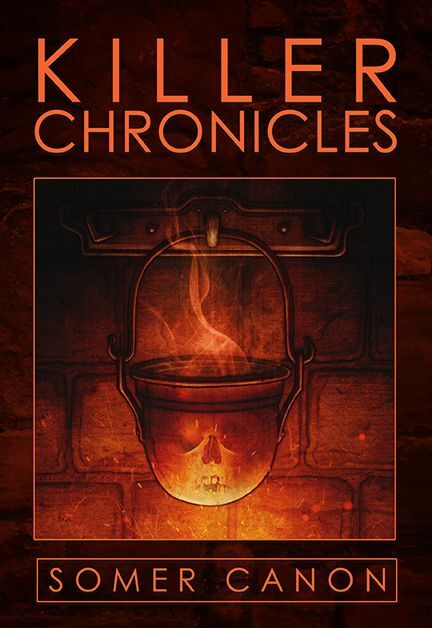 Bloodshot Books has published Killer Chronicles in paperback and ebook and the uber-talented Lynne Hansen did the fantastic cover art. Get it here! I have another limited edition release through Thunderstorm Books! The Hag Witch of Tripp Creek is a really gorgeous book wonderful for limited edition collectors. Get it here while it’s still in stock! I was super lucky to be able to be able to be in this wonderful anthology, Welcome to the Show. This book is amazing and, I must admit, my story disappears compared to the incomparable talent included within. Matt Hayward put this baby together and Doug Murano edited it. It’s been nominated for a Splatterpunk Award and is so far on the preliminary ballot for a Bram Stoker Award. The glory for this book should go to Matt, Doug, and the other writers. I was just lucky getting a story in. Get it here and see what everybody else is raving about. There will be new releases in 2019 from me and I so far have two appearances. I’ll be at the White Rose Comic Con March 22-24 in York, PA. Brian Keene, Mary SanGiovanni, Kelli Owen, Bob Ford, Stephen Kozeniewski, Wes Southard and myself will be selling and signing books, but come say “hi” to us regardless if you’re in the area! Check out their site and grab passes! Once again, I’ll be at Scares That Care Charity Weekend, sharing a table with my pal, author Wesley Southard. We’ll both be selling books and doing signings and readings. Scares that Care is a charity I care about deeply and the weekend in Williamsburg, VA is always and absolute blast. Come out and meet some of horrors most beautiful souls. Learn about the charity here and you can learn about the charity weekend here. The convention is August 2-4 this year. Alright, I think we’re all up to date. March 1, I will start sending out monthly newsletters again. If you aren’t on the list, fix that by inputting your email address at the bottom of this page where it says, Sign Up for My Newsletter! May 12 Spring House Brewing Company Douglassville, PA. Beers and Fears tour. June 8 Old Bridge, NJ Old Bridge Library. Author Panel and signing. August 3-5 Scares That Care Charity Weekend Williamsburg, VA. This post will be updated if there are additions or changes. 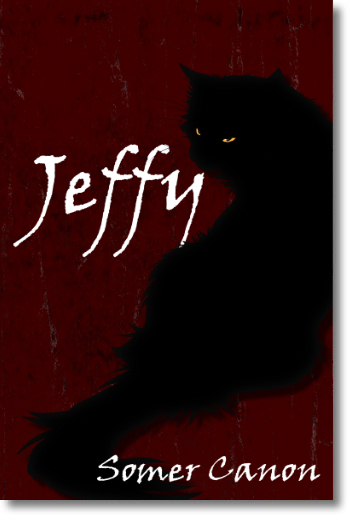 Jeffy Has Arrived in Time for Halloween! You can now purchase this year’s Halloween short on Amazon! This piece was edited by my wonderful friend and guide, Erin Sweet-Al Mehairi! Now, I mean no offense to any other international readers! I know for certain that I have U.S. and Canadian readers, but please reach out and let me know if you’re from another place! I’d love to acknowledge you! Like last year’s short, Mischief, this is available only on Kindle. Thank you for your continued support and I hope that you enjoy! Unnerving Magazine Halloween Edition Links! Hey folks! I can now share with you some of those links that I promised in my previous post. 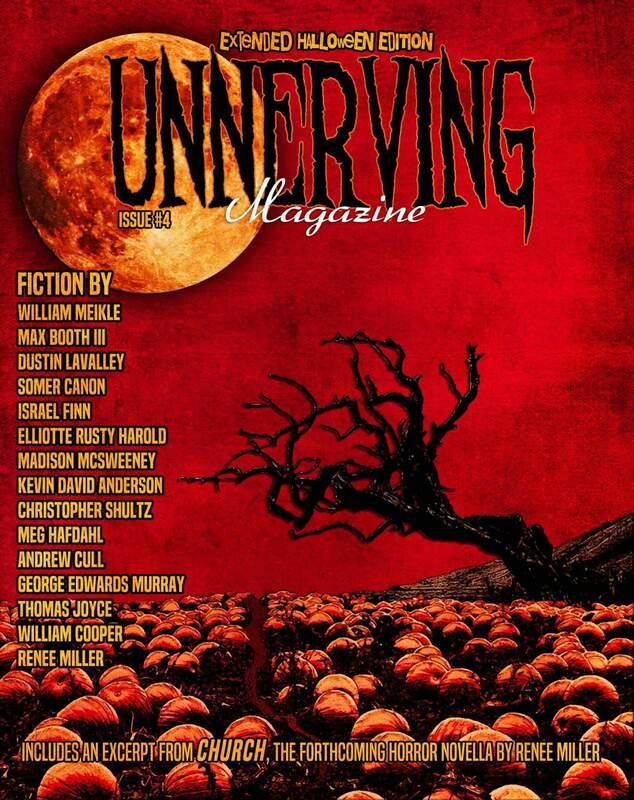 For today, the expanded Halloween edition of Unnerving Magazine is available for purchase! You can purchase this amazing edition in either digital or physical form and I’ll provide links for both. While you’re at it, I want to urge you fans out there to subscribe to Unnerving regularly. It always has great names attached to it and Eddie Generous works so very hard to put this together. They are also creeping into chap book territory as well as anthologies! And I miiiiiiight be in one of those anthologies coming up! Go here to purchase the ebook edition for only $4! You can get the physical copy here for $14! Again, I hope that you not only grab this beast of an issue, but that you subscribe to Unnerving. Keep your eyes peeled! 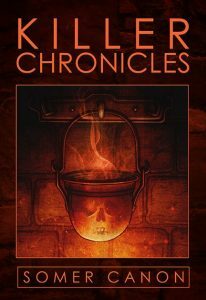 My Halloween short is in the editing phase now, Killer Chronicles is almost here, and I have news about a new anthology that I’m in! Been busy around here! Hello one and all! I hope you are all doing well and are safe! I mean, I have a news app, a decision that I regret on a daily basis, and I see that the world is completely bonkers right now. Everything is bad and hurricanes are just the whipped cream on the poop sundae we’ve got going for us. Stay safe, please. I’ve got news to share! October is going to be a great month! I mean, it usually is. Fall is my favorite season and Halloween is tied as my favorite holiday. But this year, I’ve got stuff coming for you! My novel, coming out from Thunderstorm books will be out in October! Isn’t that cover magnificent? It is not ready for order yet, but when it is, I will post links all over social media. I promise you won’t miss it! I can’t convey in any sort of educated way how excited that I am about this release. It’s my first “big” release since Vicki Beautiful and I am so incredibly proud of this work. I have a short piece in Unnerving Magazine’s BIG Halloween edition! I was so freaking happy to get this acceptance because Unnerving is a great asset to the horror genre with the articles, reviews, interviews, and published pieces. My piece is short and weird and I am so very psyched to have my name on a magazine with so many other authors that I greatly admire. 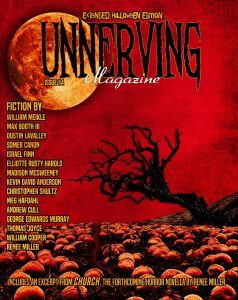 Check out Unnerving Magazine and when this issue goes live, of course, links will be all over social media! And lastly, my yearly Halloween short will be out in October! I love this cover (look forward to me saying that about everything I publish, I am easily smitten)! Last year’s Halloween short, Mischief, is always available in ebook on Amazon and is a mere $0.99 always and forever, or if you’re a Kindle Unlimited user, it’s free. If you haven’t checked it out, I hope you will and I hope that it will whet your appetite for this year’s short! Here’s a little snippet for you! It’s very rough, mind you, so be kind! The familiar is a nonessential tool that aids the witch. In olden times, the thought was that the familiar was given to the witch by the devil himself. These familiars were lesser demons who aided the “evil” witches in their terrible deeds and even occasionally killed the enemies of the witch with whom they were bonded. This, of course, is nonsense. Familiars, in my own pagan faith, are animals. I do not pretend that I am so powerful as to summon a creature of magic and command it to aide me. No, it is my belief that familiars find us, sensing in us our magic and maybe even a connection of souls. My familiar walked out of the woods behind my house one day. A proper forest panther, this long-haired black cat walked right to me and sat at my feet, looking up at me with a startling intelligence gleaming from her golden eyes. She is with me when I practice magic, in all my workings. Even if it is something as minor as a healing tea, my familiar is with me, channeling the power that I harness. My grandson named her Jeffy. It is not a dignified name, I’ll grant you, but it is her name. It is the one that I know her by and the one she answers to when I am in need of her for either magical workings or companionship. 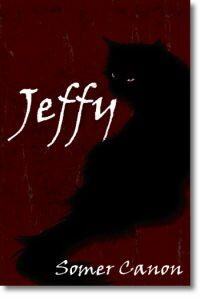 Jeffy is a good spirit. At least to me and mine, at least as long as I am living. Woe to the world that has to suffer a familiar that has outlived it’s witch. And that is all of the news for now! There will be more later, I can tell you that! As an aside, do you know those little moments that we have that make us pause and notice that we are, finally and definitely adult? Or a parent? Or one of those enormous life-changing titles? I am just now, typing this, having that kind of revelation where I really and truly feel like I am a writer. Wow. I guess I’ll say goodbye now and harness this energy and keep writing. Thanks for hanging with me and keep an eye open on my Facebook author page, or my Twitter page for those links!